Gazing at Bhimashankar's walls is the most compelling reason to visit Bhimashankar during the monsoons. Bhimashankar temple is located 50 kilometres northwest of Khed near Pune in the heart of the Western Ghats. The temple sits on a plateau that towers 850 metres over the surrounding countryside. The formidable rocky sides of this towering plateau are known as Bhimashankar's walls. 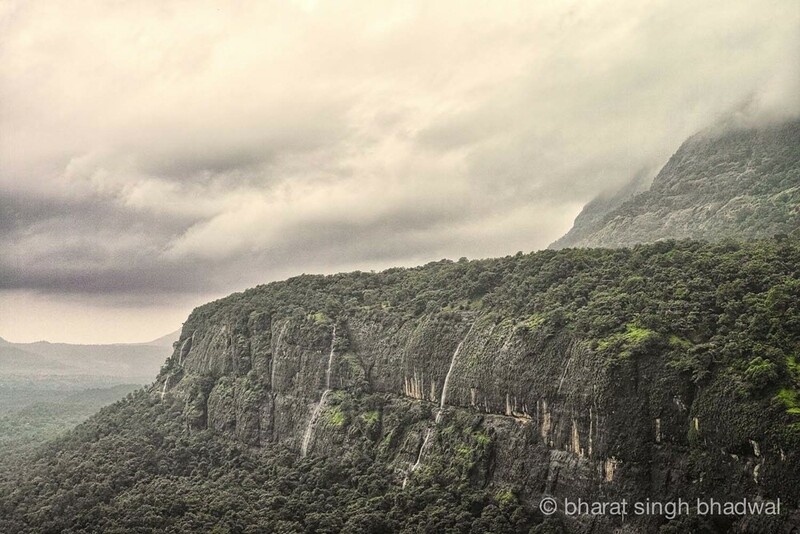 During the monsoons, this rock face is covered in lush green vegetation and is home to numerous thundering waterfalls. The best place to view these majestic walls and waterfalls lies along a trekking trail that connects Bhimashankar to the sleepy hamlet of Khandas. There are two established trekking trails between Khandas and Bhimashankar. The first of these trails is called "Sidhi Ghat". This route is named after the three ladders or Sidhi (in Hindi) that have been placed along some tricky sections on this trail. The second trail is known as "Ganesh Ghat", named after a temple dedicated to the Hindu deity Ganesha which falls on this route. Among the two alternative trekking trails, Ganesh Ghat is a longer yet less challenging route. However, what this trail lacks in difficulty, it makes up in some magnificent views of Bhimashankar's walls. The trail from Khandas to Bhimashankar via Ganesh Ghat is a 4 hour, 8 kilometre moderate trek. The trekking trail passes close to the base of a rock tower known as Paddar Killa and also along a snake hood shaped peak known as the Nagphani peak. The trail is well marked and it is often used by locals and trekkers. However, do not underestimate this trail because every year this trail catches a few unprepared trekkers off guard. Villagers at Khandas tell numerous stories about trekkers who were lost because they strayed off the trail or because they underestimated the time it would take to complete the trek and were stranded on the trail after dark. The forest near Bhimashankar is famous for its phosphorescent (glow in the dark) plants . Yet despite two nights of camping in the woods we did not come across any of these elusive plants. If you do plan to camp overnight then we recommend taking the time out at night to look for these elusive plants. It may be a once in a lifetime (pardon the pun) enlightening experience. 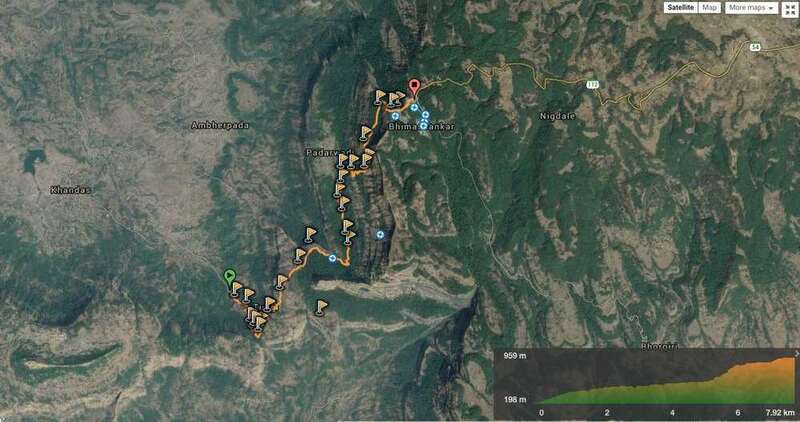 The 8 kilometre Ganesh Ghat route comprises of three moderate climbs interspersed among three gentle walks. The starting point for the trek is two kilometres from Khandas village. Khandas is located 25 kilometres from Neral and 29 kilometres from Karjat. Irrespective of whether you start from Karjat or from Neral, you will have to reach a small town of Kashele. From Kashele, a shared auto rickshaw is the easiest way to get to Khandas. The distance between Kashele and Khandas is 12.3 kilometres and it takes about half an hour by auto. Khandas is a small village with no lodges or guest houses. Nevertheless, it boasts of a small fast food Chinese joint called Akshay Chinese Corner. This small food joint caters to tourists and trekkers and the proprietor (Dashrath Ainkar 8888449434 / 8888125825) is happy to arrange a taxi or auto rickshaw to and fro the nearby town of Neral or Karjat. Neral and Karjat both have train stations and are connected by regular local trains to Mumbai City. Exactly 1.5 kilometres from Akshay Chinese Corner, on the metalled road to Mohghar there is a small bridge across a stream with a "T" junction ahead. Take a right from the T junction and follow the metalled road upstream. After 600 metres the metalled road ends near a desolate shack and a rocky walking trail leads straight ahead into a dense forest. This desolate shack doubles as a tea shop during the summers and winters and it is the starting point for the Ganesh Ghat trek. The walking trail through the dense forest starts off as a moderate climb. Pace yourself for the next 850 metres till you come across a Ganesha temple. The trekking route is named after this Ganesha temple. Just after the temple the trail makes a sharp left and continues uphill through the forest for another 1.2 kilometres. After two kilometres of climbing, you emerge from the tree cover on to a relatively flat plateau. At this point the trail eases down into a gentle climb and leads due north east. The plateau is rocky and there are numerous streams that criss cross across this rocky plateau. Halfway along the plateau you will catch your first glimpse of a towering rock pillar to your right. Known as "Paddar Killa", this imposing rock tower makes an excellent place for rock climbing. A narrow side trail bifurcates from the main trail and leads to the base of the rock pillar. Moving along the plateau you catch your first glimpse of Bhimashankar's walls dead ahead. The north end of this plateau is the perfect view point for gazing at these walls (see GPS logs). This magnificent view is the primary reason for choosing the Ganesh Ghat route over the Sidhi Ghat route. From this point on the trail turns right and continue due west. Along the way you come across an old water well. The well is shallow and the water can be drawn without a rope. Nevertheless, during the monsoons the water was muddy and not potable. This west traverse of the plateau ends at a stream. Crossing the stream requires care as there is a steep drop to your left. Situated along the stream is a small shack with a mini waterfall next to it. This shack is a good place for a snack or to dry off after a rain shower. After the shack the trail heads due north and dives into another wooded section. This wooded section is notorious for its monkeys and therefore it is advisable to keep edibles zipped up inside rug sacks. The trail meanders past a few streams and along the base of a huge boulder. It is a pity that vandals have etched their names on this boulder. A large boulder along Ganesh Ghat route that has been vandalised. A further 800 metres from the boulder, the trail emerges under the woods near a cluster of shacks. This cluster of shacks marks the spot where the Sidhi Ghat and Ganesh Ghat routes converge. This shack cluster also marks the starting point of the second and the steepest climb along this route. For the next 750 metres the route zig zags and hugs the southern wall of the plateau. There is an elevation gain of 200 vertical metres in this three quarter kilometre stretch. From this point on the trail is narrow at this stretch with a sheer drop on to your left. During the monsoons this section can get slippery with mud, wet rocks and small streams. Exercise caution especially when descending this stretch. Despite the steep climb this stretch which is exposed on the south offers some beautiful views. Nagphani peak is clearly visible along this climb and so are the lush green fields and houses of Padarwadi village on to the west. After this steep stretch the trail eases into gentle climb through some trees for the next one kilometre. The third and the final 500 metre climb is the gentlest of the three and it leads through a thicket of trees on to the top of the plateau. From the top of the plateau it is an easy walk to the Kamalaja temple which marks the end of the trek. Neral is the nearest train station to Khandas. SH54 connects Neral to Khandas via Kashele. Kasher is 12.3 kilometres from Neral and Khandas is a further 12.7 kilometres from Kashele. Shared auto rickshaws can be hired from Neral to Kashele. Change at Kashele for another auto rickshaw to Khandas. Karjat train station is 16.7 kilometres from Kashele. Karjat is connected to Kashele via SH38 and auto rickshaws and buses ply on this route. No lodges in Khandas or Kashele. Budget lodges available in Neral and Karjat. Bhimashankar plateau experiences heavy rainfall and it is often covered in low clouds during the monsoons. 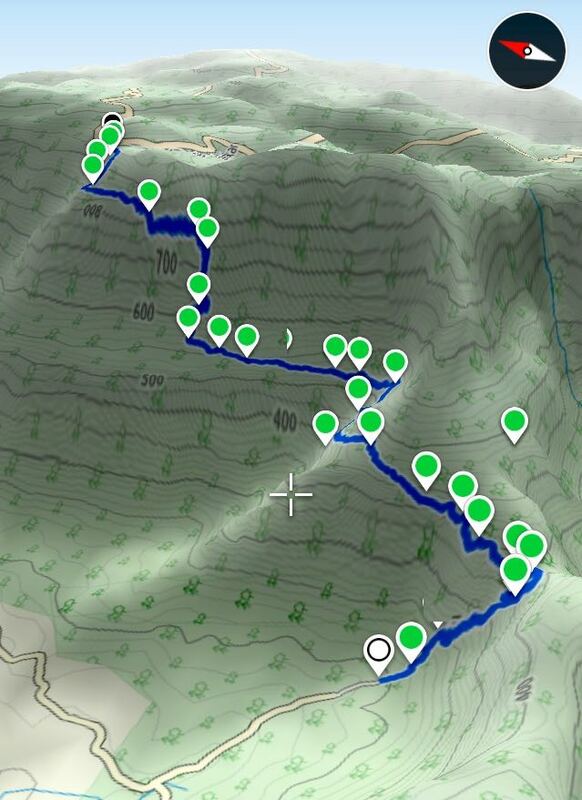 3D route overview that shows the 3 climbs on the trekking trail. Caution - Low clouds often cause a whiteout which in certain instances may reduce visibility to under 5 metres. During a severe whiteout it is best to stay put and wait out the whiteout to pass. A GPS device or a smartphone with a preloaded route map is extremely helpful in a whiteout.